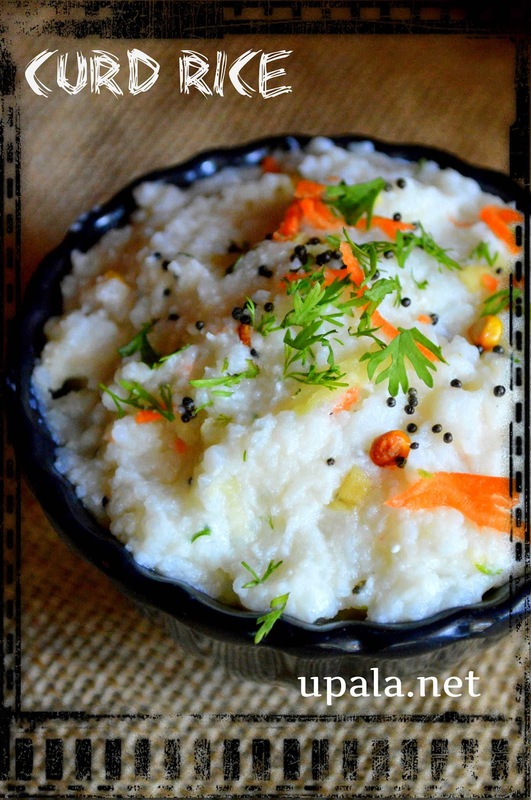 Curd rice is an easy recipe and can be made in mins. It is also called as Thayir sadam or bagala bath. As a kid I use to run and hide when my mom brings curd rice but it is one of the comforting food especially in summer. 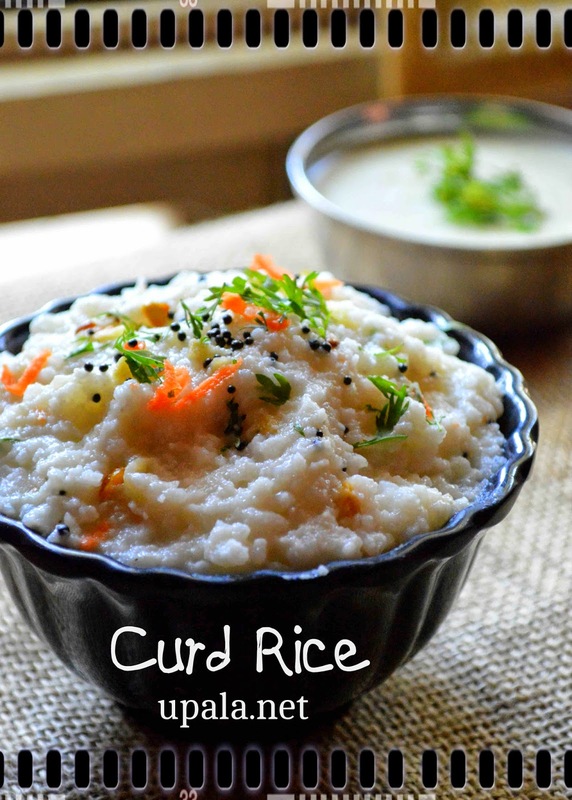 I have tried many variations in curd rice and will share all. 1) Take the cooked rice when it is warm using a potato masher mash it nicely (if you dont have this masher, use a spoon or laddle or some prefers to mash it with hand). 2) Add milk and mix well using the same masher and let it rest for few mins. 3) In the meantime season the ingredients given, make sure to break the red chillies and sauté. 4) Add curd to rice when it is completely cool and add the seasoned mixture, green chilli, ginger, carrot, cucumber, raw mango, salt, coriander leaves and curry leaves. Mix well with a laddle. 5) Add butter finally and mix well. Curd rice is ready to be served. 1) You can add 2 tbsp of pomegranate seeds or seedless green grapes or dried grapes according to availability and taste. 2) You can skip channa dal and add broken cashews to make it rich. 3) Curry leaves can be sauté with seasoned mixture and added or can be added raw. 1) The rice needs to be slightly overcooked with more whistles for curd rice. I have used steamed rice, generally raw rice is used. If in case you want the normal rice (not overcooked one) to make curd rice, then mash it nicely with potato masher when it is hot. 2) This curd rice becomes thick as it cools, its better to have warm milk and can be added as per consistency while serving. 3) The veggies carrot, cucumber and raw mango are optional according to availability and also can be finely chopped and added instead of grating.